Jefferts Schori said that it could take 50 years for the debate over homosexuality to be resolved, but that she believes it will happen. 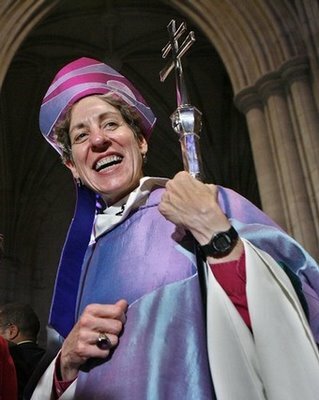 She said she hopes that the Anglican Communion, an umbrella organization including the Episcopal Church and the Church of England, will stay together. Read the whole story here…….. This entry was posted on Monday, November 9th, 2009 at 6:44 am	and is filed under Anglican Communion, Current divisions. You can follow any responses to this entry through the RSS 2.0 feed. You can leave a response, or trackback from your own site.